The WhatsApp voice calling feature is once again being made available for users around the globe and this time, it looks like the company isn’t just testing out the new option as it has been live for over a day now. The downside is that only those with Android smartphones will be able to enable the capability and there’s no word on when it’ll be released for iOS and other platforms. We’ve seen voice calling on WhatsApp go live a few times already, but was quickly shutdown. This suggested that the company was merely testing to see if things worked smoothly. There’s still no official announcement from the developer as yet, but many reports online state that the feature is live. You’ll have to get the latest version of the application to access voice calling and it can be obtained through Google Play Store or from the company’s main website. The procedure to enable it is still the same – You’ll basically have to get hold of someone who already has the VoIP feature to give you a call through the application. So basically, it’ll take quite a bit of time if you’ve got no one on your contacts list with voice calling active. Nevertheless, the new capability as been much sought after and people are probably spreading it around like wildfire. There’s a good chance that WhatsApp might just flip the switch for everyone through a future update. You’ll know if voice calling is active on your account when the main UI automatically gets modified. You’ll see three different tabs where one is dedicated to calls, a second for chats and a third for your contacts list. 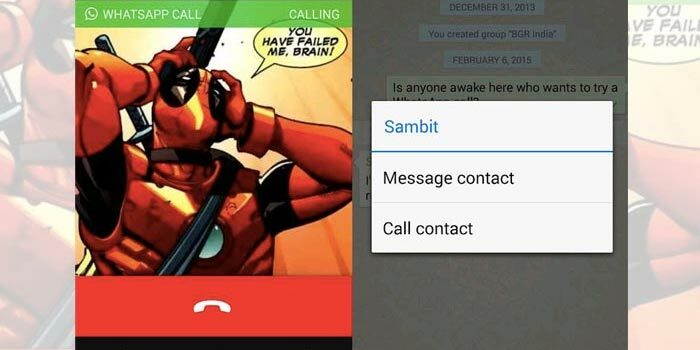 Also, calls can be placed to those only with the new version of WhatsApp installed. And just to remind you, stay away from messages inviting you to enable voice calling on WhatsApp through links that take you to external websites as they’re scams.